^ Malcolm Macmillan, An Odd Kind of Fame: Stories of Phineas Gage (MIT Press, 2000), pp.116-119, 307-333, esp. pp.11,333. ^ Liston C et al (2006). “Stress-induced alterations in prefrontal cortical dendritic morphology predict selective impairments in perceptual attentional set-shifting”. J Neurosci 26 (30): 7870-4. doi:10.1523/JNEUROSCI.1184-06.2006. PMID 16870732. ^ Rajkowska G. “Morphometric methods for studying the prefrontal cortex in suicide victims and psychiatric patients”. Ann N Y Acad Sci 836: 253-68. doi:10.1111/j.1749-6632.1997.tb52364.x. PMID 9616803. Richard M. Burton, The Anatomy, Chemistry and Genetics of Human Behavior, Newport. 1996. Miller EK, Cohen JD (2001). “An integrative theory of prefrontal cortex function”. Annu Rev Neurosci 24: 167-202. doi:10.1146/annurev.neuro.24.1.167. PMID 11283309. Lebedev M et al (2004). 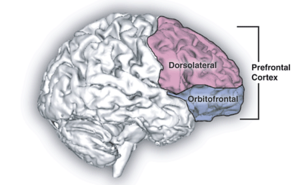 “Representation of attended versus remembered locations in prefrontal cortex”. PLoS Biology 2 (11): e365. doi:10.1371/journal.pbio.0020365. PMID 15510225. 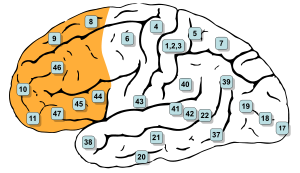 Fuster JM (1997) The Prefrontal Cortex: Anatomy, physiology, and neuropsychology of the frontal lobe, 2 Edition: Lippincott, Williams & Wilkins.